03/05/05: Sunset District Neighbors and SF history buffs gathered at 4329 Kirkham Street near 47th Avenue, where workers removed four 1906 Earthquake Shacks. Fewer than 25 remain of the 5000 shacks that were retrieved from camps following the City's recovery from the 1906 Earthquake and Fire. 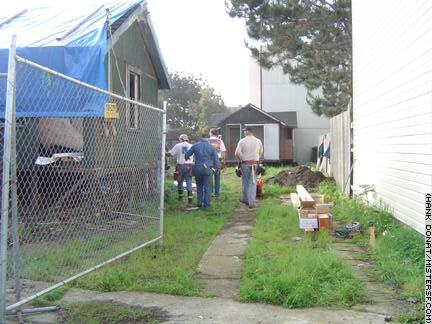 Members of the Western Neighborhoods Project spearheaded today's effort to relocate the Kirkham shacks to property owned by the San Francisco Zoo. There, the shacks will be renovated for use during Centennial celebrations next year.